Let me just start by saying that I am really excited to be writing this post. A little known fact about me is that I am actually a Black Friday expert. I mean, I don't have a degree in it or anything (if that existed I totally would), but I've had my fair share of Black Friday's to know how to expertly navigate my way through. I've been going to Black Friday with my mom since I was a pre-teen. From the moment I waited in my first all night line outside of Walmart- I was hooked. We plan for this day months in advance, and perfectly calculate our every move to insure we get what we went there for. I am Canadian, but my mom lives within 15 minutes of the Maine border, and I'm about an hour from it. We buy the majority of our items at Walmart, then either move on to other stores in the States, or go back to Canada to hit the sales there. Black Friday has only been a thing in Canada for the past few years, and although the sales aren't comparable to those in the States, it's still nice to have the option of shopping at home. Since my son was born 3 years ago, I have been hitting the sales here in Canada more often for convenience sake, but the same Black Friday tips apply. This step needs to be done a few months in advance due to work schedules, travel time, etc. Before they even release the Black Friday flyers, you need to get a team in place. Your team is there to help you get everything on your list, and you're there to help them do the same. You travel together, wait in line together, and carefully coordinate your plan for once you're inside the store. Your team can consist of friends, family members, co-workers, etc. It's important to ask people who are prepared to wait in long lines, aren't anxious around crowds, and preferably have a bit of Black Friday experience- although it's always fun taking a newbie along for their first trip. About a month before Black Friday, the flyers start showing up online for some of the stores. Walmart is a big one and they usually don't release their flyer until a week before the sale. Before the flyers even come out, it's important to make a list for items you're looking to buy. I usually make a list for each person I'm buying for, and a list of household items I want for myself. 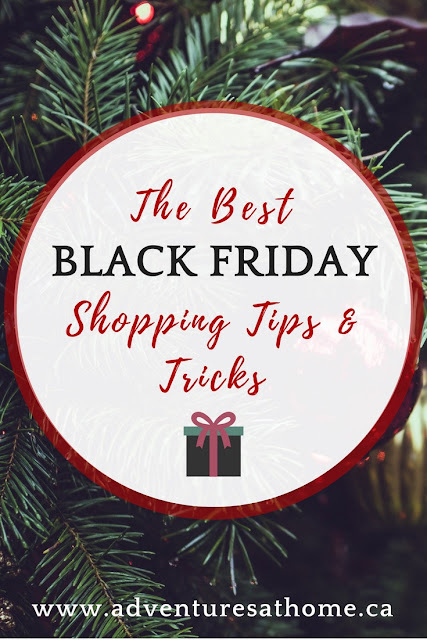 It's easy to go overboard during Black Friday because everything is so inexpensive, so if you're on a budget like myself, make sure you do not deviate from the list. Once the flyers come out, make your master list of items you're looking to buy depending on the store. It's important that you check the original price of the items before deciding to buy them, so you can see if you're really getting a good deal. You also need to decide which items take priority and go to that store first. We always prioritize Walmart because it has a good combination of electronics, household items, toys, etc. It's like a one stop shop for most of the things on our list (not sponsored, I swear). Since I've been doing Black Friday in Canada, I prioritize Toys R Us because they usually have the items I want to buy for Mason, at really discounted prices. This is the fun part- your game plan. This is where you coordinate with your team to figure out your plan for the day. Start by checking the flyer to see what time your store is opening that day. Stores used to open at midnight the night before, but lately have been opening at 6am instead- this also depends on the laws in your state or province. If the flyer says that it varies by store, contact your store to ask when they're opening. Next, go to your store and ask for a map of the sales. Most stores will have this online to print out as well, but if not, just ask an employee. This is a map that shows you the layout of the store and where every item will be located. Its usually a lot different than the normal layout of the store, so don't expect to find items where they're normally located. Before Black Friday, take some time to check out the normal layout of the store with your map. Sometimes it's easier to visualize where things will be if you're actually in the store, so bringing your map on a normal day will let you figure out exactly where things will be. Next, figure out what time you're meeting up with your team. It's usually easier if you all meet at the same house and go to the sale together. Bring multiple vehicles if necessary, but make sure you're arriving at the same time. If you're going for big ticket items like TVs, popular toys, or computers, you need to find out the "rules" for those sales. For bigger items, sometimes you need a ticket to get it, and it's going to be first come first serve- which means you NEED to get there early and wait in line outside the store. Bigger items are going to be in limited quantities, so if it's something you really want, you need to be there early. I recommend going at least 2-3 hours before the sale starts to wait in line outside. Sometimes they tier the sales, so you have store access at one time, but the item wont be available until another time. In these cases, a ticket or waiting in line inside the store is going to be necessary to get the item. I've spent many a Black Friday sitting on store floors with other customers waiting for a big ticket item. You will make friends in line- there's a fun sense of community at these sales (aside from the few crazies you may encounter). If a store is going to have tiered sales, they will specify it in the flyer, but always ask an employee ahead of time if you aren't sure. With your team, take some time to figure out who is going for what items. The great thing about going with several people is that you can all spread out across the store to collect the items on your list. For example, if 2 of you want the same vacuum cleaner, just send one team member for both so you cover more ground and have a better chance of not missing out on what you want. This wont work with the big ticket items, but it will work for the smaller items on your list. Make sure you have constant communication with your team members through a group text, and plan one place to meet in the store once you've gotten everything. After you meet up, you can separate all of the items and get ready to head to the check outs. I can't tell you the amount of times I've seen someone trying to cram a big screen TV into the back of their small car. It's just not going to work. A lot of people get so excited about the sale that they forget to bring a proper vehicle to fit all of their items. Make sure that at least one of your team members has a large SUV or truck if you're planning on getting a large item. If you're planning on hitting other stores after, a trip home first to drop off your items may be necessary, as you don't want to leave expensive items in the back of a truck while you shop. These things need to be planned for ahead of time. If more than of you have large items on your list, make sure you have enough room in your vehicles for everything. If you have a small car, borrowing something larger from a family member may be necessary. If you live in a colder climate like I do- layers will be your best friend! Standing outside for hours gets pretty chilly in the early hours of the morning, but you'll quickly warm up once the shopping commences, so layers is important. I recommend a t-shirt with a long sleeve shirt or sweater over it, then warm pants, your jacket, gloves, hat and scarf. I went Black Friday shopping when I was 6 months pregnant with our son (I do not recommend Black Friday shopping while pregnant), and I brought a camping chair with a large blanket to wrap up in while we waited outside. It was probably the most comfortable time I've ever had waiting in line. I had an extremely smooth pregnancy with him, I was healthy and I didn't over-do the shopping that day, so if you insist of braving the stores while pregnant, make sure to prepare accordingly. Wearing comfortable shoes is EXTREMELY important. This is not a day to wear your cute heeled boots. You're going to want comfortable broken in sneakers/running shoes. Wear 2 pairs of socks if it's especially cold out, but just make sure your shoes are comfy and practical. Also keep in mind that you're going to be wearing them ALL day long through long long lines, walking endlessly through stores, etc- and no one cares what your feet look like. Just be comfortable. It's important to stay hydrated and well fed today, but remember that bathroom breaks will be limited. A lot of people bring coffee to drink while standing in line, but I personally wouldn't if I plan on being in line for a long time because there are no bathroom breaks while standing in line. I recommend a bottle of water and an energy/protein bar to start with. After your first store, you can go through a drive-thru for a better breakfast. If you have any medical conditions, please consult with your doctor before doing Black Friday, and bring food & drinks accordingly. You will be standing in line and shuffling through crowds of hundreds- please please make sure your money is in a safe location. I recommend a cross body bag that stays on you the entire time. A backpack style bag is not ideal because in the endless lines and shuffling, anyone can unzip it and steal from you. You want to keep your wallet inside of the inner most zipper in your purse, and keep your purse within view of you at all times. If you're a man, keep your wallet in your front pocket, or safely zipped inside of your jacket. I like to give everyone the benefit of the doubt- on every day other than Black Friday. I've seen people have items stolen from their carts before when they weren't looking. If you stand in line for hours to get gifts for your loved ones, the last thing you want is someone taking it when you aren't looking. Make sure you don't leave your cart unattended, and don't turn your back for long unless another team member is with you. I understand how badly your child might want the newest, hottest toy this year- but please remember the Tickle Me Elmo incident and do not put yourself in harms way. If chaos breaks loose and you feel unsafe at any moment- forget the item and get out of the crowd. No toy or TV is worth being trampled over, and your child would much rather have their parent safe and sound at Christmas than a new toy. Also, if any fights break out while you're in the store, do not approach them thinking you can break it up (unless it's involving a loved one). In Canada, this is less of an issue because Black Friday is pretty tame here, and lets face it, we're polite people. In the States however, they're allowed to carry concealed weapons and you never know what someone might pull out during a fight. You DO NOT want to be in the middle of that. I've been going to Black Friday in the States for years and have never encountered a physical fight or anything involving weapons, but there are always news stories after regarding incidents that happen, so it's best to be prepared just in case. 10- Don't Bring Your Kids! This is mostly for the American Black Friday- please leave the kids at home! There are going to be INSANELY big crowds, long lines, pushing and shoving, cart bumping, an abundance of vehicles in the parking lot, etc. This is not a kid friendly sale. I'm sure most of you are buying for your kids so they won't be going anyway, but I've seen my fair share of children at Black Friday, and they all looked extremely tired and unhappy. My 3 year old doesn't even like waiting in line at the grocery store with me, I can't imagine him going to Black Friday. I understand that not everyone has access to a babysitter, but trust me- unless you're going later in the day once the crowds disperse, you don't want to deal with having your kids there. The Canadian Black Friday is much more tame and the crowds aren't as crazy. I brought my son to the Canadian one when he was 7 months old and he slept in his stroller the ENTIRE time. It was great. Now that he is older I wouldn't bring him because of the long lines- and I would never ever bring him to the American Black Friday. He stays home with daddy during the sale, because my husband went to Black Friday ONE time and says he won't do it again lol. Make sure to check out the online sales too! Not everything is available online, but there are some amazing online Black Friday sales that pop up every year, and as a bonus- you don't have to find a sitter for the kids, and can shop in your PJs! Comment below and tell me your most fun or craziest Black Friday story! These shopping tips are spot on! Like you said, make sure to pack LOTS of snacks and your patience. We always have one person stand in the line at Target while others keep shopping. Those lines are no joke! Good tips! I definitely agree on not bringing kids. Actually, I agree with all of these! This would have to be the best Black Friday post ever! It is obvious how super organised you are and people need to follow advice like this. You have really thought of everything here! Great tips! wow you seem like a pro at black friday shopping! I am printing this blog post to reference my future black friday shopping trip. now that I am a mom, these tips count and are very helpful. thank you! I always tell my self I'll have a plan for Black Friday and we usually end up just aimlessly walking around stores and buying stuff we don't need haha. Love how organized you are ! Lol I needed this, and you are right about the kids thing - they def get in the way and want you to buy everything!